A friend of mine posted a picture of his wife at Easter, and I though – oh, she’s more pregnant than I realized, I should get on that baby quilt…. The next post on Bookface had the bambino coming a little early. Little Baby A is just fine, and has been at home for a few weeks now. Enter the bowtie baby blanket. Dad wears bowties, so I thought it was appropriate. When I went to a trade show last year, I picked up two packs of charm square that are sewing related. 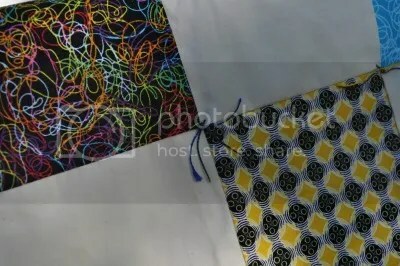 When I took out the fabrics that had shears and sewing machines on them, it tones it down to just interesting squiggles. This is a super simple block, and I was able to get the front pieced in one afternoon.I used white muslin for the background fabric. I decided to use Ikea home decor fabric for the back – it was in the stash. Did I mention that I did not have to buy anything to make this? Everything came from the stash, even the batting. I love the hippos. Whimsical and cute. I pillow finished it, also known as envelope finishing. The first time, I made the quilt sandwich wrong (that’s what I get for rushing. I honestly know better), and had to rip it out. The second time, I made it correctly. No binding! I don’t mind binding, and really enjoy the hand part of it, but this was all about getting things done in a timely manner. I had thought to use the hippo outline to quilt it, but decided that it would be too fussy, and I wanted the emphasis to be on the blocks, not on the quilting, which is my usual MO. I used two strands of rainbow pearl cotton held together to tie it together. Simple, easy, and fast. I also like how the colors don’t clash with All of the Color in the rest of the quilt. It ended up being 34 1/2″ x 53″. Perfect for the car and the crib. Welcome to the world, Little A! April’s Project Half Done is the English paper pieced Grandmother’s Flower Garden I started… three years ago? In 2012, I made all of the ladies in my knitting group small project bags, and not all of the fabrics were to my personal taste. I decided that I would take the scraps and make paper pieced flowers. I used muslin for the centers of the flowers, since that’s I had on hand. I finished putting together all of the flowers, and then put them aside. 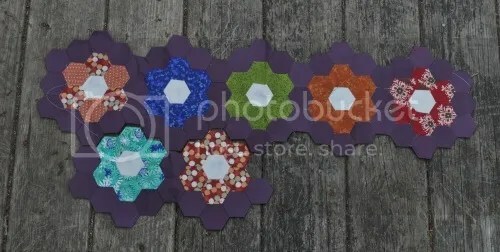 I had picked out and purchased the purple Kona, but hadn’t cut or basted any hexagons. I chose 1″ hexagons, and cut most of them out myself, the goal being to not spend much more money on a scrap project. Last week I completely put together the first row, and have started on the second. I’m going to have rows of 5 flowers, followed by rows of 4 flowers. 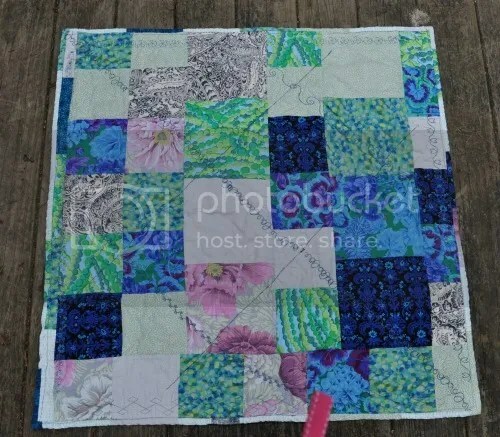 I think I need to make 6 more flowers to make a decent sized middle, The plan is, I think, to piece the center, and then piece a number of large solid colored flowers for the border, to make this a decent sized baby quilt to put in the stash. Once I get this EPP project done, I’d really like to start either the Farmer’s Wife Quilt, or paper piece a Lone Star Quilt. More progress soon! 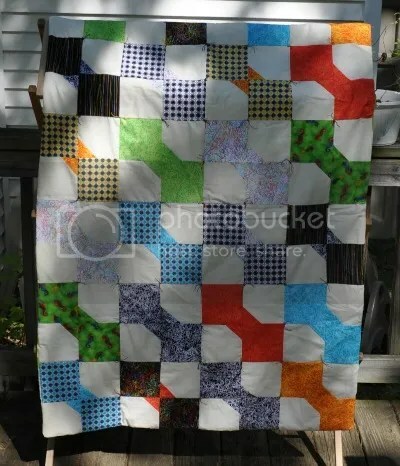 Glimmerglass Baby Quilt – Finished! 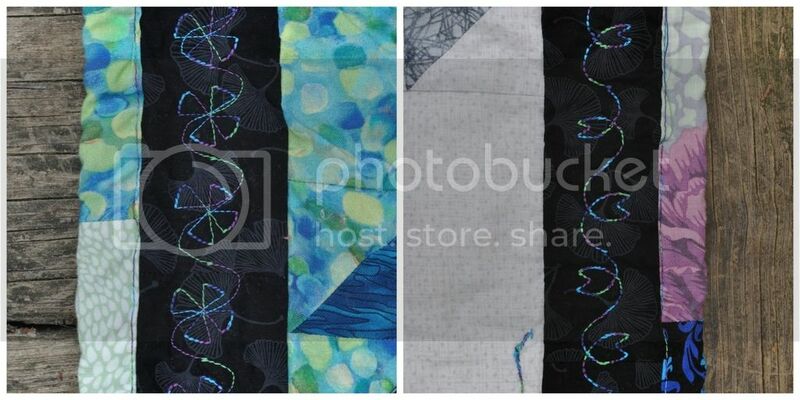 Last summer I took Nancy Feve’s Glimmerglass quilt class at G Street Fabrics in Rockville, MD. I put the beginnings of the quilt top away, and picked them up again in March to finish. 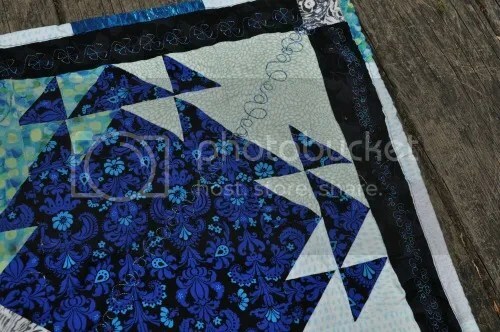 It turns out that I had actually pieced most of the 1/2 square triangle sets, and just needed to sew together the rows. I really learned the importance of the scant 1/4″ seam allowance, and pinning seams and points in this top. I was able to finish piecing the top in two afternoons, and added a black border, with leftover black and white print squares in the corners. I wanted it to look like it was framed. From farther away, I can see where I didn’t have enough contrast in the grey and peony blocks. Still, I’m happy with how it turned out. I used a mutlicolored King Tut thread, and quilted in diagonals across the quilt. The thread has colors that pick up the florals in the blocks. I used huge decorative stitches in the border to show off the color, and give a little more contrast. You can really see in the picture above how I pieced the binding from leftover blocks. Ignore the small piece of pink ribbon – it’s from my pajama bottoms. I was outside on my back deck to take this picture. I pieced the back with the leftovers that I didn’t turn into more glimmer squares. 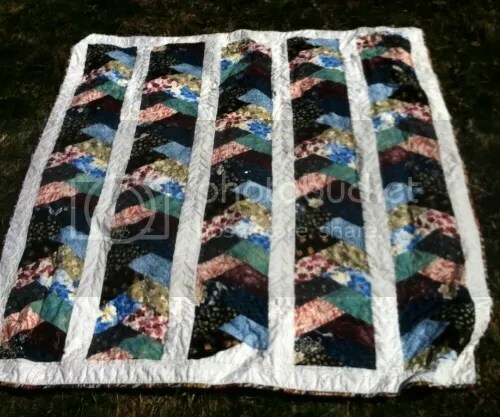 You can really see the diagonal quilting and the binding. I machine sewed on the binding on the front and back, instead of hand tacking it to the back as usual. 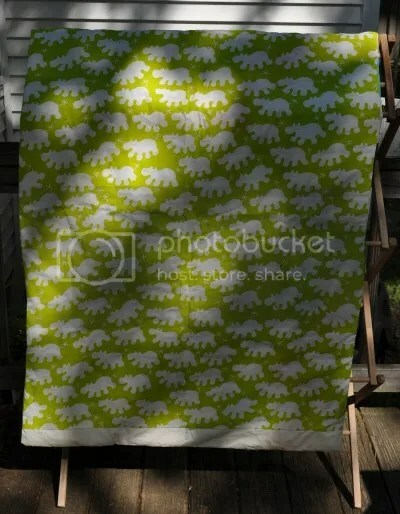 Since this is a baby quilt, I imagine it’ll get a lot of washing. It ended up being about 40″ x40″, and will go into the pile for the next baby. Ahh, another quilt from the UFO pile turned into a finished object. I really am trying to finish things up, and it feels really good to cross things off of the list. That doesn’t mean that I don’t have 50 bazillion ideas in the queue, but let’s discuss this one, first? I started this friendship braid quilt last fall. I wanted to make a quilt for my best friend, who lives on the other coast. 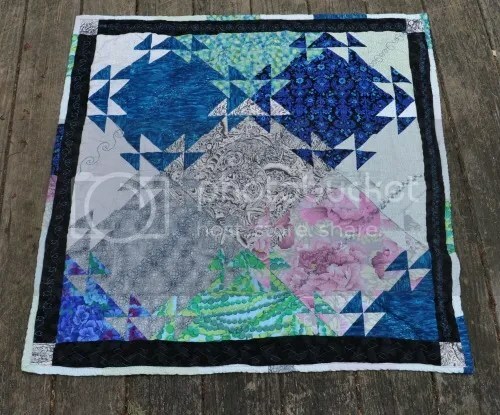 She not only is very understanding of the “I’m making you a thing, but it’ll get there when it gets there” timeline, but is also a quilter herself. She hand-pieces and hand quilts her quilts, and she does really appreciate the work and thought that goes into the things I make her. She’s also an enthusiastic gift receiver. I used 13 different Japanese inspired prints, not from any one collection for the braids. I used the HexNMore ruler to cut half hexagons for the braid. A moment about this ruler – I love it. It makes cutting different sizes really easy, and I don’t have to do math. Cut, rotate, cut smaller sizes out of the left overs. I have the really small one, too. I got them both at my LQS. I used this basic pattern to put together the quilt. I didn’t have quite enough to do five strips, so I added a bit of the back ground to the middle strip. You can’t tell from the iPhone picture, but the background is this really beautiful color on color chrysanthemum pattern. I wish I had bought a bolt of it- I love it that much and keep going back to it to use it. Unlike my usual, I didn’t piece the back of this quilt. It’ll be easier for Elle to use either side of the quilt. I did embroider a label, and stitch it to the bottom corner. I like doing something a little different, so this one is round. I quilted it on a BERNINA 780, using one of the built-in loopy decorative stitches. The binding came from my stash. 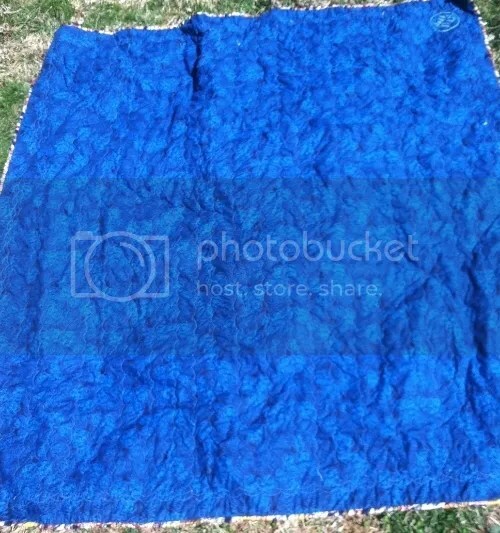 The quilt ended up being 76″ x 80″. Over all, I had a lot of fun putting this together. The friendship braid pattern is one of my favorites, and I can tell that I’ll be making it again and again.